The organization of oil-producing nations has had quite an impact on the price of crude over the past year. Less than two years ago, many oil industry watchers thought that OPEC was no longer able to influence the oil market because its members couldn't work together to address the oversupply problems that caused crude prices to crash. However, instead of fading away, the organization has once again become relevant: It not only was able to agree on a deal to curb production, but has achieved historically high levels of compliance with that accord. As a result, oil prices have improved dramatically over the past two years. More recently, the organization has demonstrated that it can move the price of oil by simply talking openly about what it might do next. Those comments have sent the price of crude on a wild ride in recent weeks, battering oil-price sensitive stocks in the process. With OPEC trying to maintain its relevance, investors need to focus on oil stocks that can thrive no matter what the organization says or does next. However, there have been some concerns recently that crude has gone too far, too fast and could start slowing down the global economy. The IEA had already seen some evidence of this as high oil prices have started cooling off demand growth, which it now sees coming in slightly lower than its initial estimate. Тhere have been several reports recently that OPEC is talking about increasing its oil supplies by as much as 1 million BPD so that oil doesn't get out of control and cause even more demand destruction. Those discussions alone have had a notable impact on the price of crude, sending it down more than 7% from the peak last month. Crude could continue sliding if OPEC decides to boost production before its current agreement expires at the end of the year, which would hurt oil producers that are reliant on higher prices to support their operations. On the other hand, for many large U.S. oil producers, it doesn't matter what OPEC does, because they spent the past few years repositioning their businesses to prosper at lower oil prices. Devon Energy (NYSE:DVN) is one of many producers that has sold assets to help pay down debt and reduce its cost structure. As a result, Devon is on pace to grow its U.S. oil production at a mid-teens compound annual rate through 2020, which would expand cash flow at an even more impressive 25% rate. Furthermore, Devon can achieve that fast-paced growth as long as oil averages $60 a barrel, and it would produce an estimated $2.5 billion in free cash flow over that time frame. That ability to generate a gusher of cash at a lower price point positions Devon for success in the coming years. Marathon Oil (NYSE:MRO) is another oil company built to thrive at lower oil prices. At $50 oil, Marathon can generate enough cash to grow production at a 10% to 14% annual pace for the next several years while living within cash flow. At $60 oil, Marathon's plan would generate about $500 million in free cash flow. With oil above that level even after the recent OPEC chatter, Marathon is on pace to produce a windfall of excess cash this year. 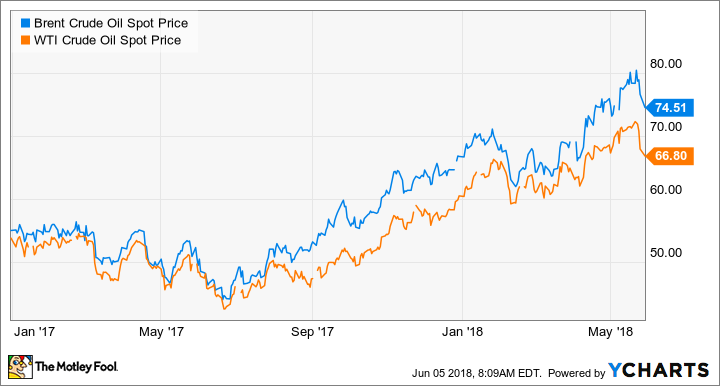 Diamondback Energy (NASDAQ:FANG), meanwhile, can sustain its current production rate and dividend even if oil prices fall back below $40 a barrel. However, with crude in the $60s, Diamondback can grow production by more than 35% per year while living within cash flow, which it could accelerate to more than 45% per year at a sustainably higher oil price. Diamondback's flexibility to adjust as oil prices change is a crucial competitive advantage over weaker rivals in an uncertain oil market. As OPEC regains relevance, it's able to manipulate crude prices, which will have an outsize impact on smaller, financially weaker oil producers that desperately need high prices to sustain their business models. That's why investors should focus their attention on top-tier oil producers like Devon, Marathon, and Diamondback -- they'd be just fine if OPEC causes crude prices to cool off even further by boosting its production.